I’m Eirini, a Greek background 25 year old that lives in Melbourne, Australia. I’d like to start by saying thank you to Mohamad for inviting me to share a little bit about Greece, as a guest writer in his wonderful Blog “Around the World” section. Greece is an absolute gorgeous country despite the economic situation. Beautiful islands, ancient and historic sites to visit, great climate, breath-taking beaches, crystal clear waters and blue skies, amazing food and wine, rich in olive oil and so much more. So much culture and history in just one tiny little country. Greeks, being one of the oldest civilizations among the Persians, Romans, Chinese, Mayans, Incas, Egyptians and more, have offered and been one of the most influential civilizations to ever exist. Its history has changed the ways of the world up to this day, including the Olympic games, the concept of democracy and a senate, brought us the theater, architecture, philosophy, mathematics, created the base for modern geometry, biology, physics and more. Socrates, Alexander the Great, Aristotle, Plato, Homer, Pythagoras, Archimedes, Euclid, Leonidas I, Hippocrates… all the history books are filled with their names, people whose inventions, theories, beliefs and heroics have had a significant influence on subsequent. All these, make me truly proud to be Greek. You can’t travel to Greece without visiting Acropolis, a historical site that epitomizes ancient Greece. On this rocky hill used to be the old city of Athens, which is topped with Parthenon, a temple made for the goddess of wisdom and war, Athena, who planted the first olive tree and found the city of Athens in the in Mycenaean times. There is other archaeological building remains in acropolis such as Erechtheion,Old Temple of Athena, Propylaia, Theater of Dionysus and more. Please refer to picture map above and the links at the end of the post. If you’ve visit and enjoyed Acropolis then stopping to see the parts of it, that were put into the museum, is totally worth it. Having a look at the original parts preserved in this beautiful modern museum is incredible. The museum it self is fairly new and modern. You could easily spend an entire day if you have the gift of time. Photos inside the museum are not permitted, but here is a few from the outside I took on my last visit. This mountain is located right at the center of Athens. It is a nice hike and once on top of the mountain, you’ll get the best view of the city from all angles, as well as be able to see Acropolis. On top the mountain there is a small Greek Orthodox Church, St George and just below it a cafe, Horizon Cafe/Restaurant. If you can’t be bothered with the climb, you can take the Funicular Railway at a 2 euro cost each way. Again, Greece has a lot of history and culture. Here is a few additional archaeological sites, you could visit. Even tho Greece is rich in history and culture, that is not all it is about.. So here is a few more things about Greece. Greece has some of the most gorgeous islands. Our beautiful and exotic Greek islands attract a lot of tourism, making them one of the world’s top travel destinations. With more than 2,000 islands to choose from you might initially be astonished by the number and variety. 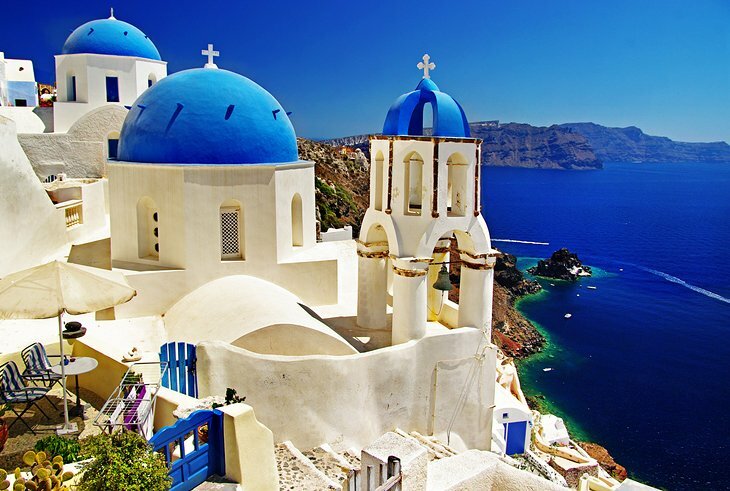 From gorgeous beaches, ancient ruins, colorful harbors and active volcanoes the Greek islands have it all. The most dramatic of all the Greek islands, Santorini, from the Cyclades group and one of the most picturesque islands, is definitely one of the best places to visit in Greece. It is best known for the cliff-top towns of Fira and Oia, which lie on the west coast, overlooking the deep, blue sea-filled caldera. Also part of the Cyclades, Mykonos features a modern, cosmopolitan society blended with traditional whitewashed houses and maze-like streets. Located in the Aegean Sea near the coast of Turkey, Rhodes is the capital and largest island of the Dodecanese archipelago, popular for its great beaches and historical significance. The northernmost of Greece’s Ionian Islands, Corfu was controlled by many foreign powers, notably the Venetians and British, which is reflected in its culture and the architecture on the island. Not far from Corfu, Chios is an ideal place for sightseeing. Situated in the center of the island is its most notable historic site, Nea Moni, an 11th century monastery. Crete, the largest Greek island but also the most populated, is where you will find the most variety in hotel accommodation, restaurants, shops and nightclubs. This island features beautiful beaches, scenic mountains and gorges, you can enjoy a wide range of outdoor activities here like hiking, mountain climbing, horse riding, gorge trekking, swimming and more. History lovers will want to explore the many historic and archaeological sites that dot the island such as Knossos Palace, which dates back to the Minoan civilization. There is other famous, well known and popular island in Greece you could visit (over 2000 islands,remember?). Check out trip advisor for more recommendations on the Greek islands if you’re planning to visit.. Us Greeks, loooove our food!! There’s a lot of variety, many robust flavors, and tons of cheese and meat as most Mediterranean cuisines. Contemporary Greek cookery makes wide use of vegetables, olive oil, grains, fish, wine, and meat. Other important ingredients include olives, eggplant, zucchini, lemon juice, vegetables, herbs, bread and yogurt. I’m sure you’ve all heard of souvlaki but that’s not our only food. If I start naming the dishes, it won’t mean anything to you so I’ll just pop some pictures. There is so much more, but I already feel like I’ve been carried away a little. For more details about Acropolis visit Athens Guide. You can also find more information about the pieces in Acropolis museum HERE. This entry was posted in Around the World and tagged Greece, Travel on May 31, 2017 by Eirini. I love getting inside tips and local knowledge before visiting a place. I had my first trip to Greece which was amazing. I’d already been advised to visit Koufinissia by a Greek I’d met at a wedding – great tip! Can’t wait for my next trip to Greece. I LOVE Greece. I’d already been advised to visit Koufinissia by a Greek I’d met at a nuptials – expectant peak! I’d already been advised to visit Koufinissia by a Greek I’d met at a wedding ceremony – enceinte pourboire! I LOVE Greece. ❤ its gorgeous . I LOVE Greece.